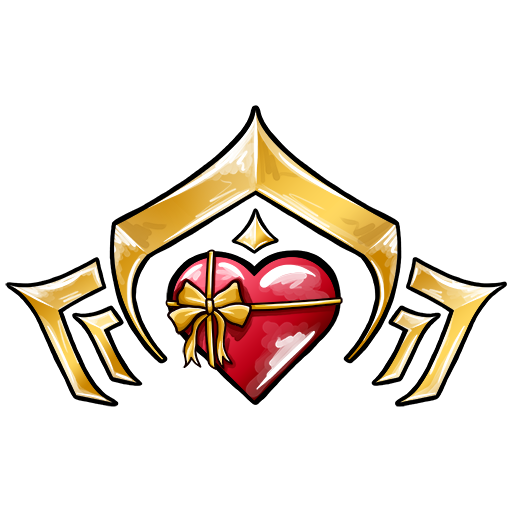 IMPORTANT: While the poem is complete, the locations and credit section isn't. This'll take me a while to complete without help. If you feel up to the challenge, then please follow the template I use below and document the Kuria. You originally found. If you mentioned it in an earlier post, please reference that post. I don't want to miss credit anyone for their discoveries, but in the past week the amount of posts on this thread have doubled. I'm at university. I don't have time to sift through all of them right now. 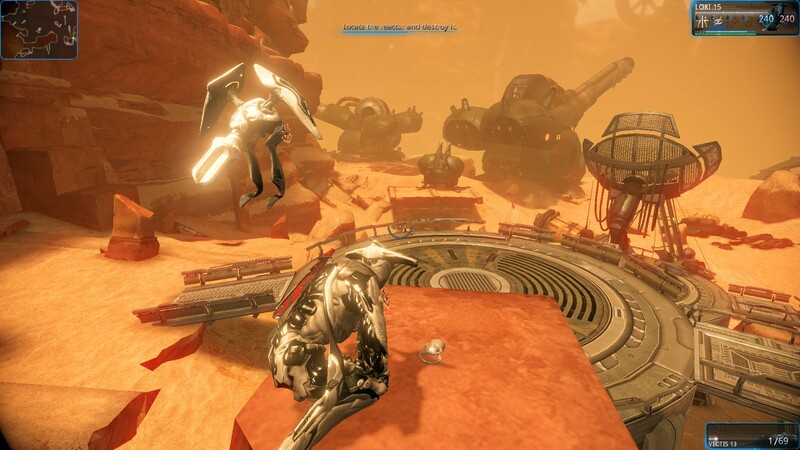 The Oddities are an evolving easter egg, in the form of small statues resembling either a cylindrical Orokin pot with ears, or an un-skinned cat statue. 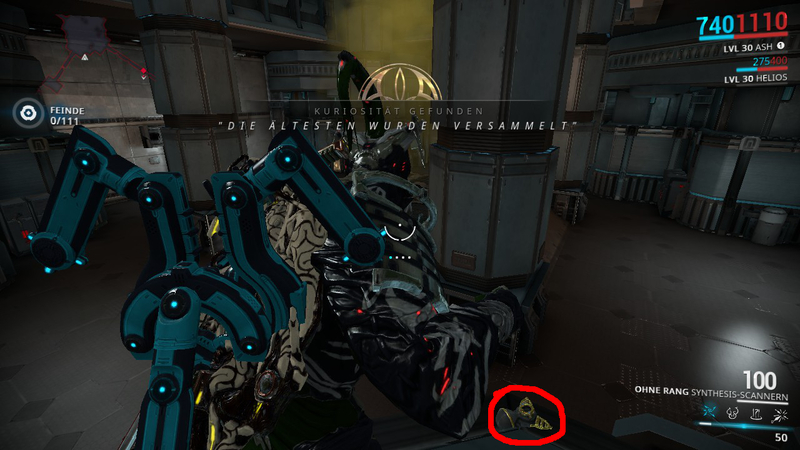 DE has hidden a large amount of them throughout the tiles and we're on a hunt to find them. 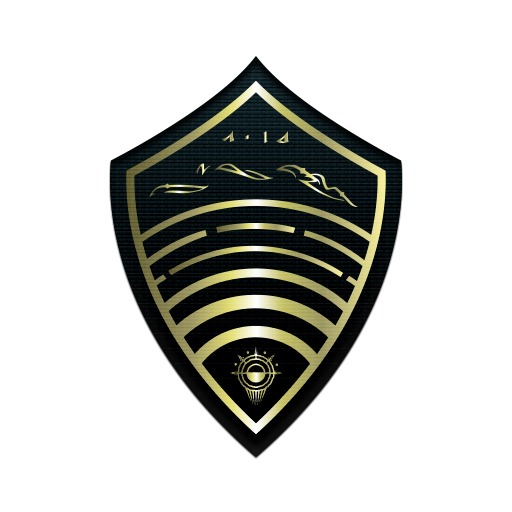 The pot design, or Kurai, show up on the codex scanner. When scanned they reveal a line from a poem. 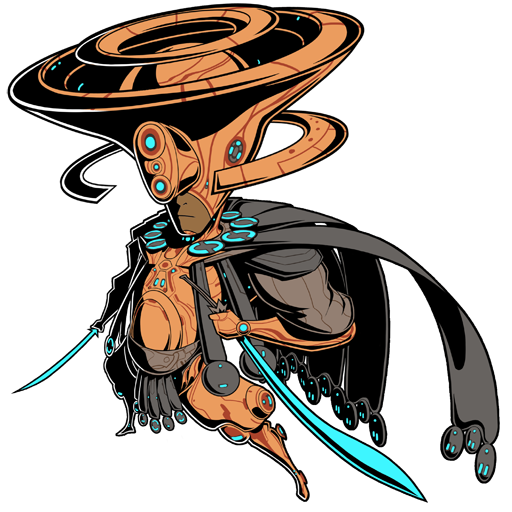 As of now, the poem seems to reveal the story of the Grineer queens. The cats however are far more elusive and reward less. They don't show up on the scanner, and give no reward for finding them, however they are just as important in this hunt. 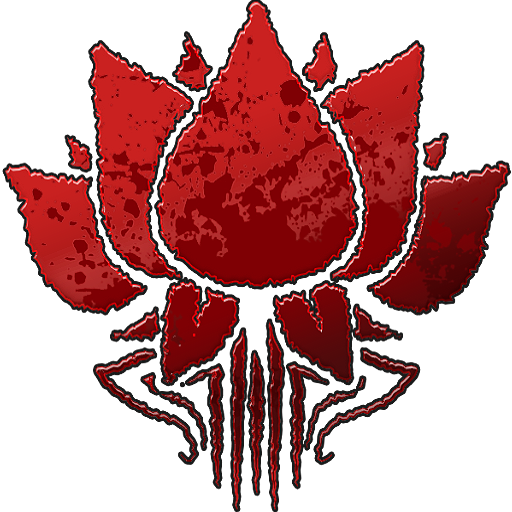 They are the origin of the Kurai, and finding more of them may cause the Devs to reveal more easter egg updates. 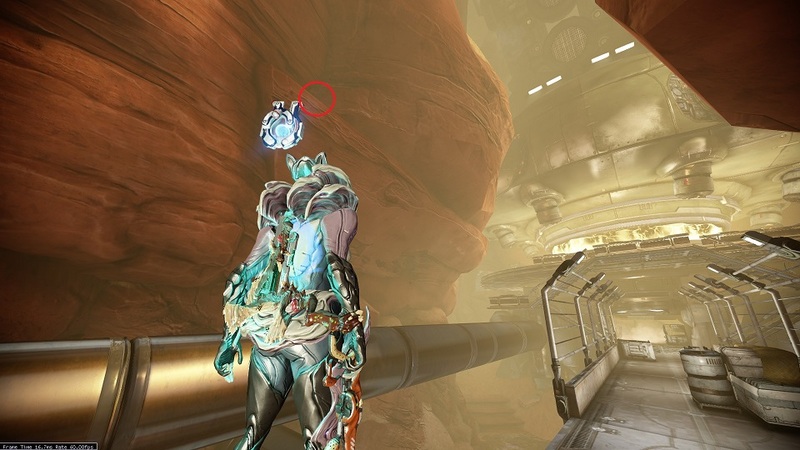 Oddities are generally hidden in places you'd never normally look like the edge of the map, on the roof, in the floor, or just really hard to access areas. 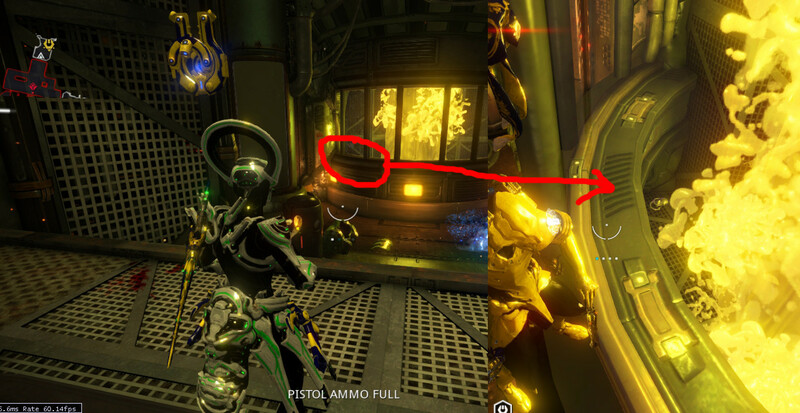 They can even sometimes be in areas behind glass or in water. 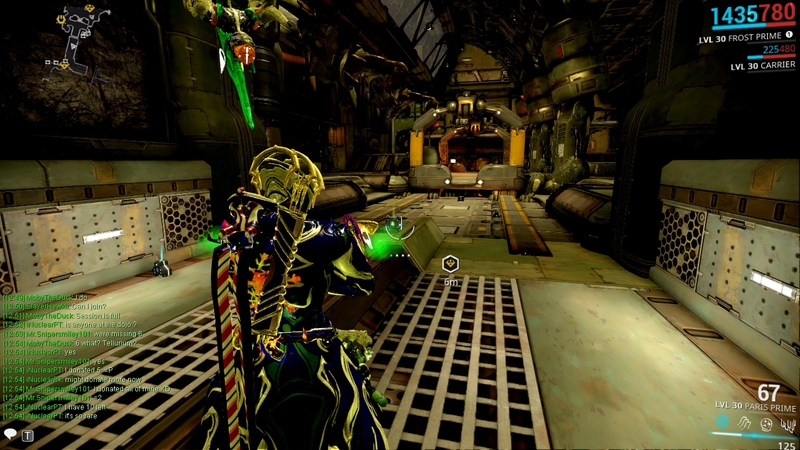 The best frames to use are Volt, Nova, Valkyrie, Zephyr, or a Loki, and make sure to bring a good spin melee weapon. 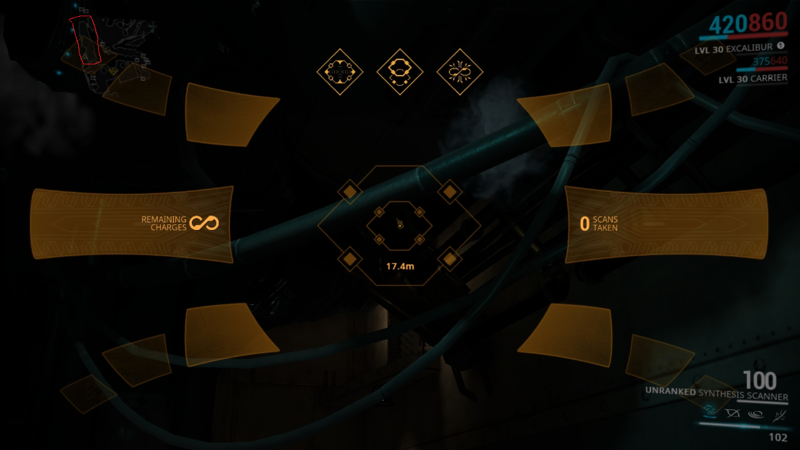 Since the Kuria show up on the scanner, it is very easy to find them by scanning a room and looking for their distinctive shape and yellow image in the scanner HUD. 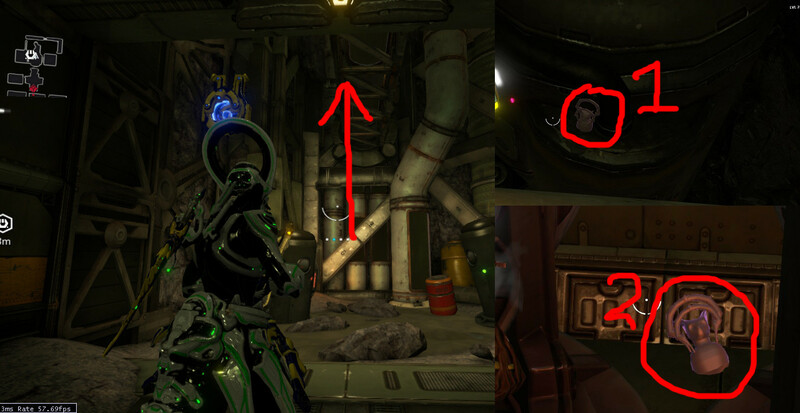 For more hints check out the ones we've all found. 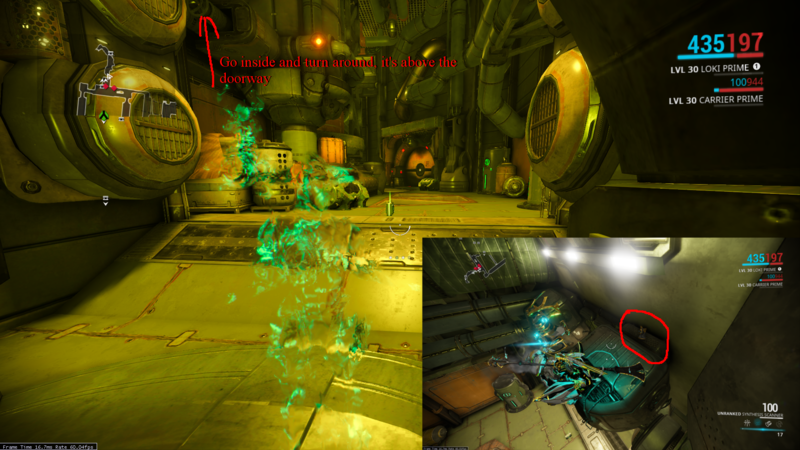 Once you find an oddity, be sure to screenshot it, so that it's clear how to find it again. For Kuria, also make sure you record the line in some way. It makes it much easier to catalog them and detect double ups. 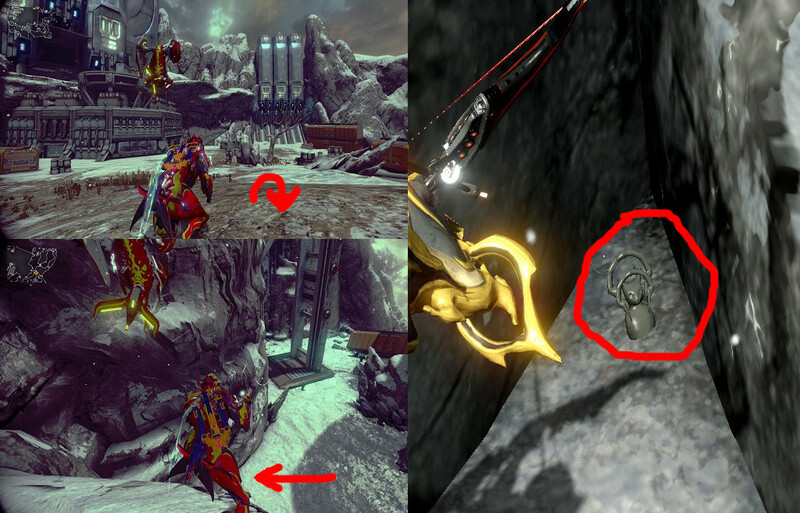 Description: This is only found to the left of the extraction point that has the two Kubrow dens. On the left of the extraction pad look down and there will be boxes. The Kuria is on one of them. 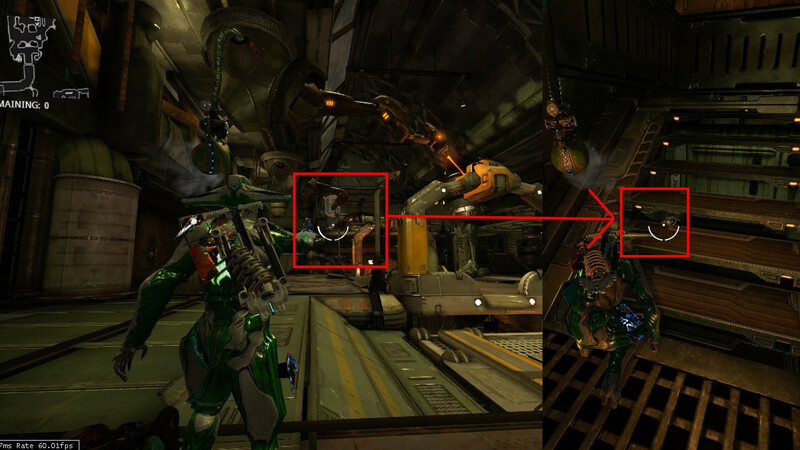 Directions: In the deception tile, there is a room full of crates. 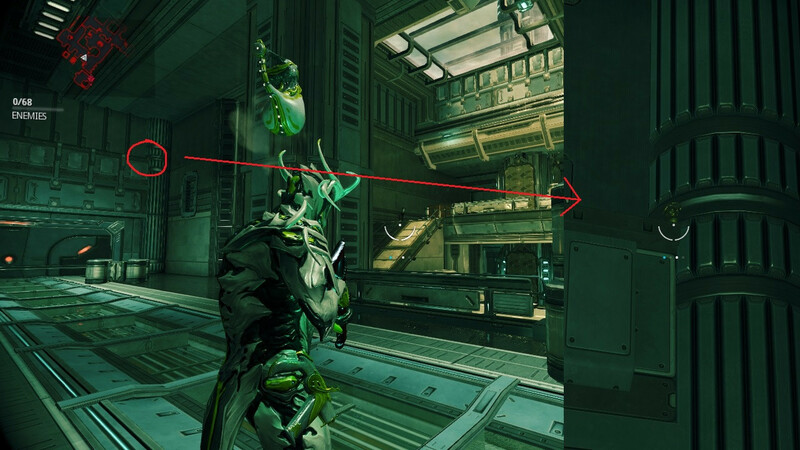 Stand in this room so that you are facing the objective, and then go to wall on your right. 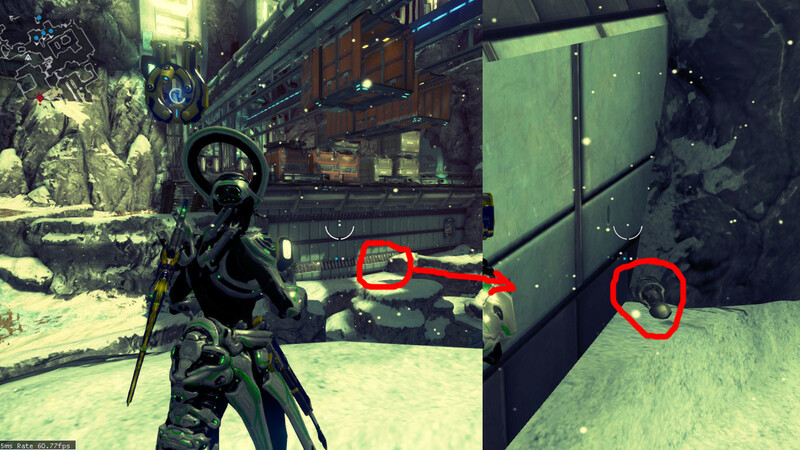 The wall is see through, full of moving Grineer machinery (space mines?). 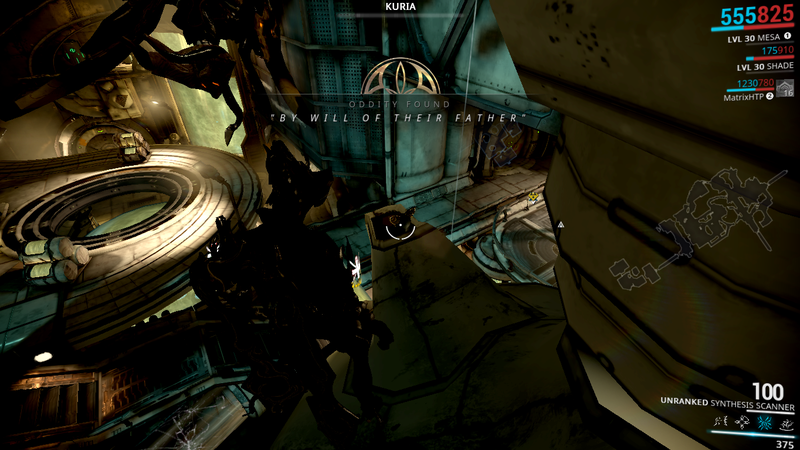 At the objective side of the wall is the Kuria, it's quite hard to see because the mines get in the way. 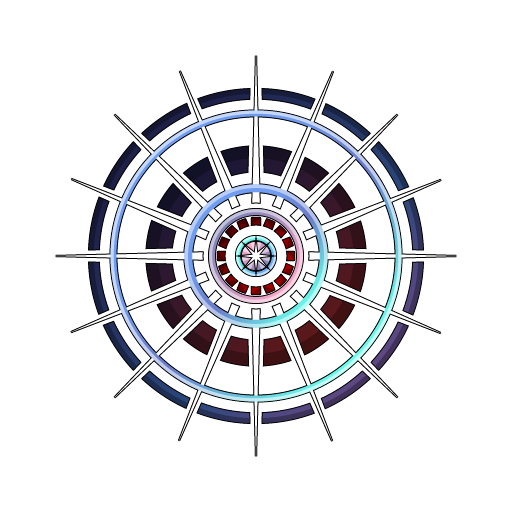 Description: Located in a huge room with multiple circle-shaped platforms. 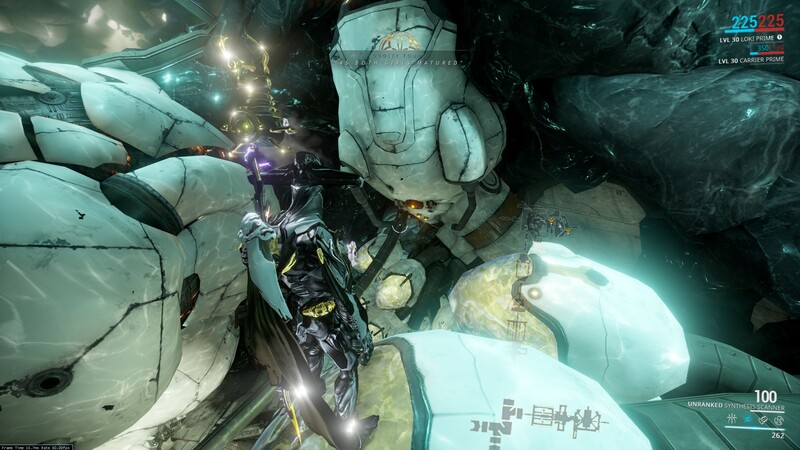 Almost 80% of the floor is water which you can dive into with sharkwing. 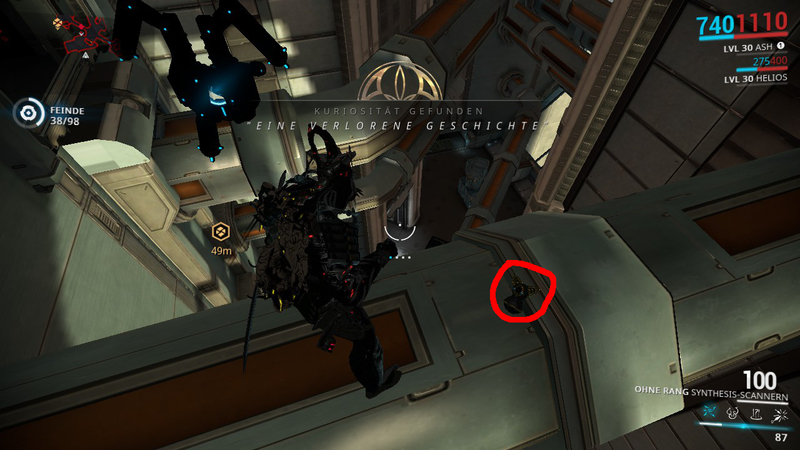 There is this huge Tube in which some grineer are practising diving. 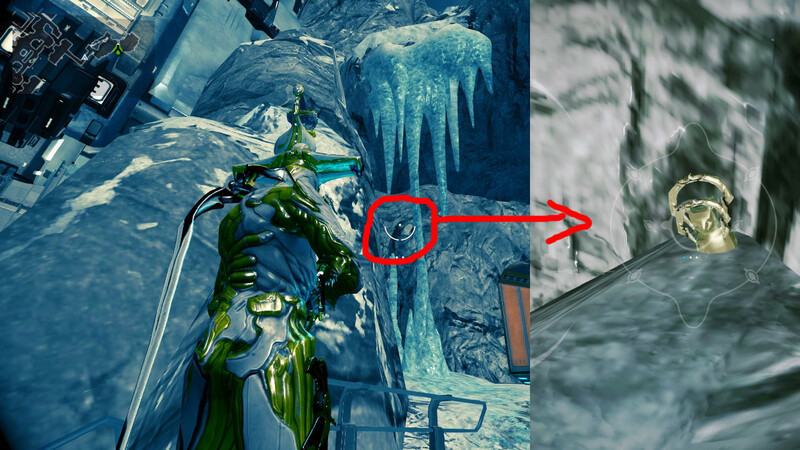 That tube has this access hatch like feature on it's side and there is the Kuria in the picture. Description: Rescue Chamber, high on top of tubings. Directions: In a dead end room made of 2 cylinder shapes, walk to the far one and look up. 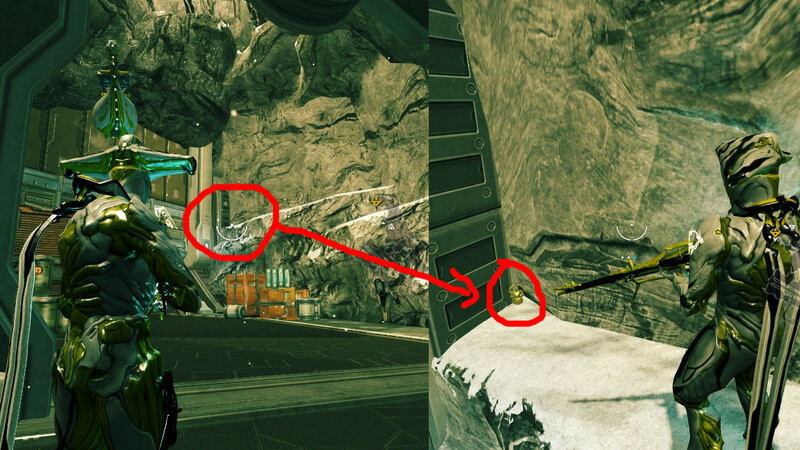 There will be two supply caches by the ceiling. Wall run up between the wall and the central shaft till you reach one. Behind one of the lockers is the cat. Directions: In the dead end room that curves to the left with a high roof, look up to the left as soon as you go through the door. Description: In the Sealab Tileset, there is a tile with a large frozen cavern in the middle, in one of the corridors that leads onto the central cavern there is a Kuria hidden between some pipes close to the ceiling, unfortunately, it is either bugged or obstructed by something, because I was unable to scan it from any angle, even though it was fully visible. Directions: Dead end room in the shipyard. Go to the back of the tram, and you will see a staircase. Go down. When you get to this room, turn around and look under the stairs. Directions: In a dead end chamber with water on the floor and a few pipes over hanging is a vertical shaft you can climb. 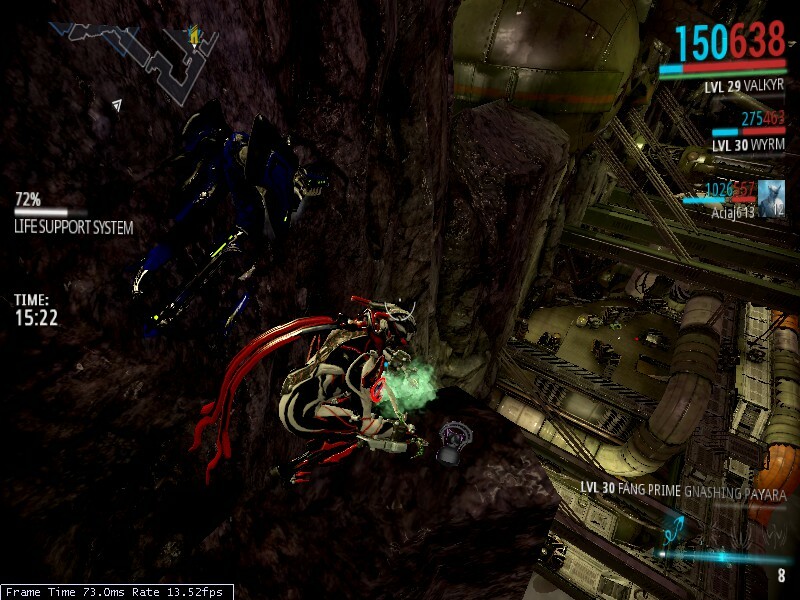 To do this, it’s good to bring a Mirage (amazing wall climbing stats), Volt or one of the teleporting frames. It's possible with others, but it’s bloody difficult. 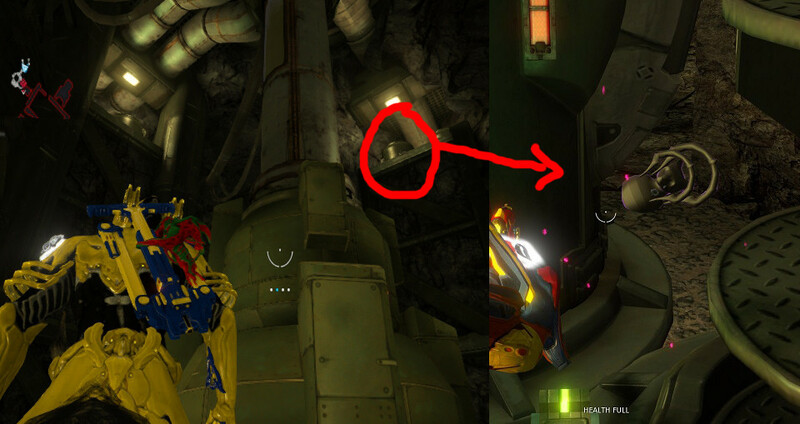 11) If the way you entered is south, then about half way up the shaft to the south west is a car statue nestled into a piece of Grineer machinery, it’s very easy to see. 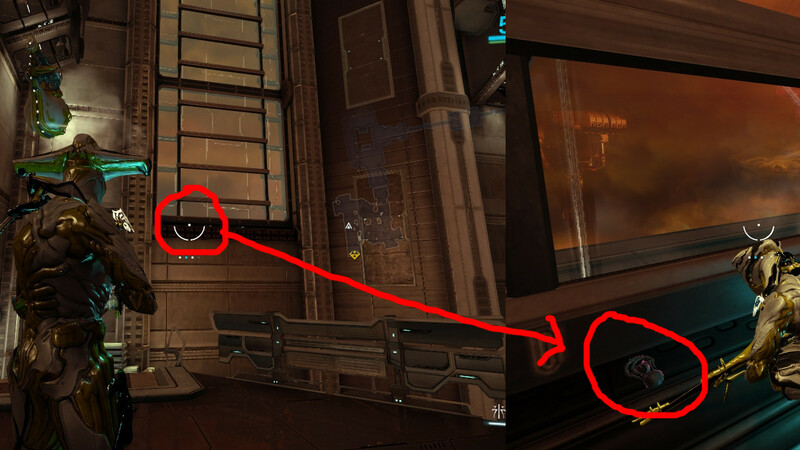 Directions: Where the 3 entrances intersect, look up and you can find 3 lockers on a balcony. 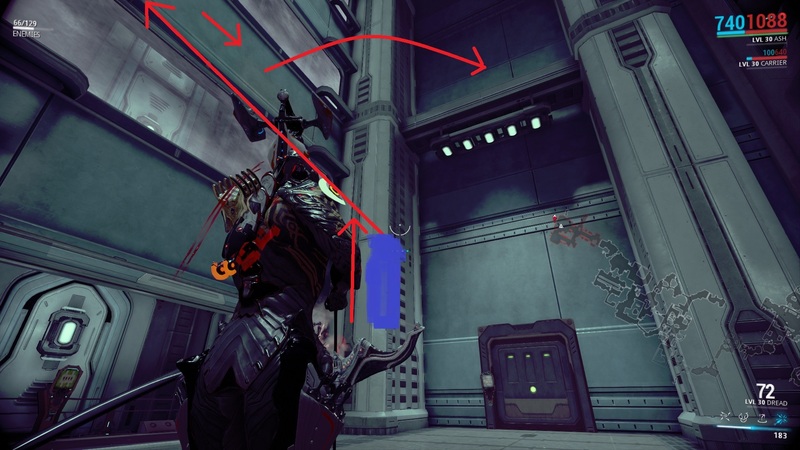 Facing the balcony from the extract point there should be an unmarked wall on your left you can use to run up onto the balcony. Keep going forwards until you find the statue lodged in a wall. 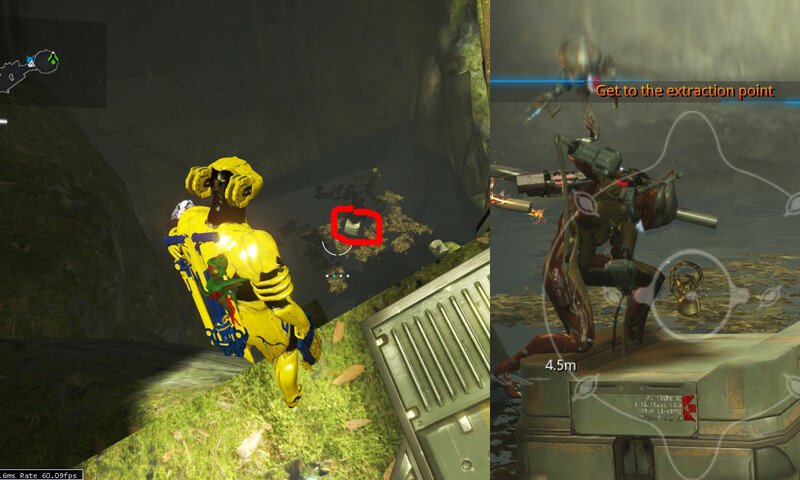 Directions: On the mobile defence tile outside on the path where the stairs lead you up is an orange corpus shipping container. Jump on top of that, then the ledge that's right beside that. At the corner where the ledge meets the wall is the cat. 24) In between the crevice in the centre of the tile and the north base, tucked into a corner is the cat. Directions: Find the large outdoor tile shown below. Turn around and go down the Elevator. 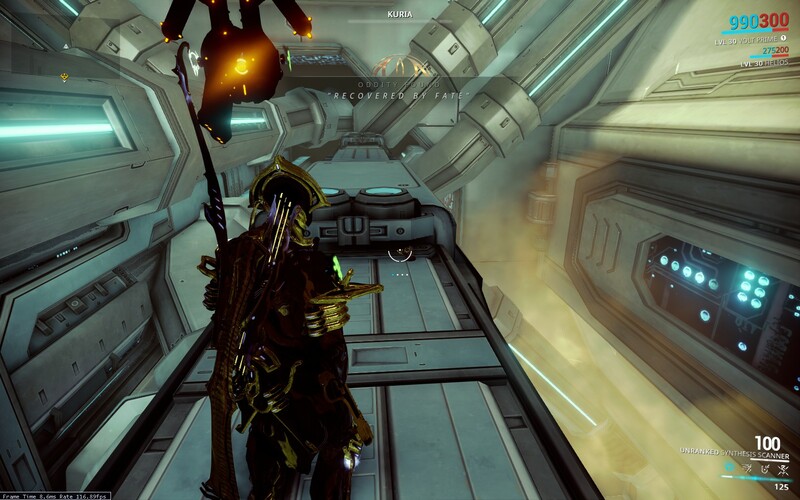 When you get to the bottom, turn around once more (So you aren't facing the Elevator Control Button). Keep going left until you find a little crevice when you can clip into a little bit. 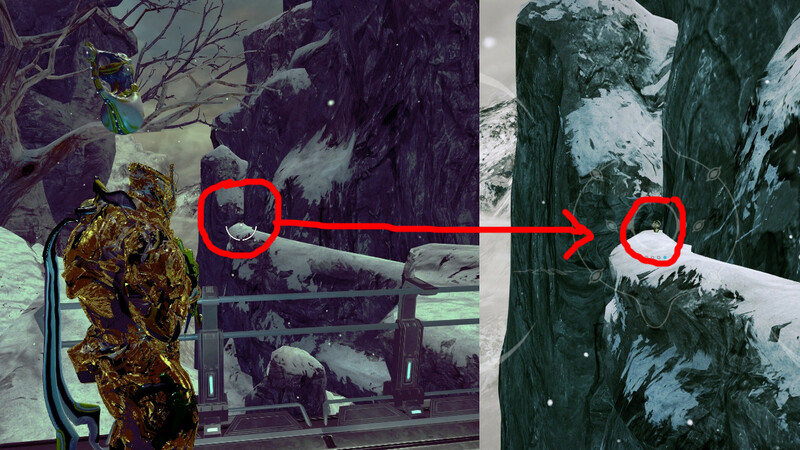 In the vertex, you find the cat. As of August 1, the game changed. 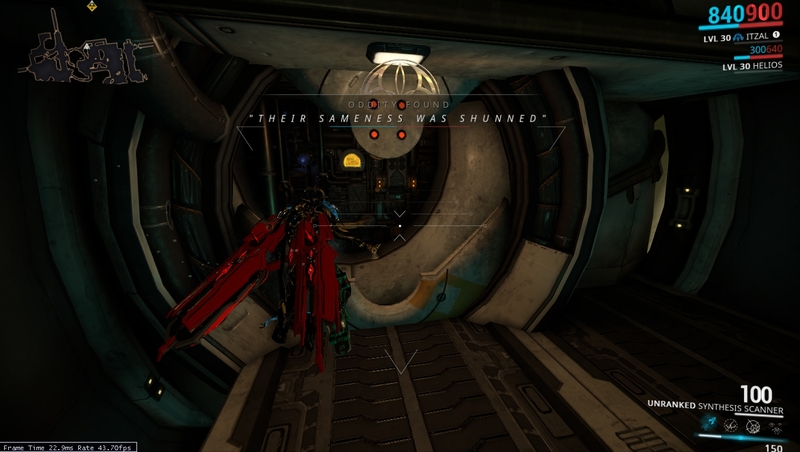 A large percentage of the cats were re-skinned and became scannable, revealing a hidden poem about the grineer queens along with a hidden secret. As of yet, neither have been fully discovered. 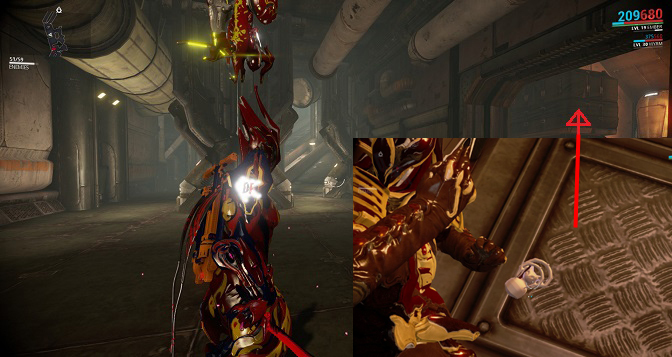 These new re-skinned cats were called Oddities, or Kuria. 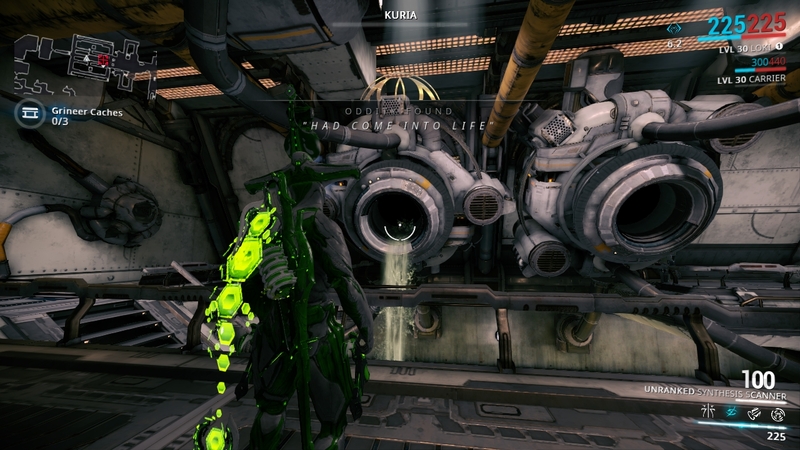 Kuria translates to "clear" in Japanese. 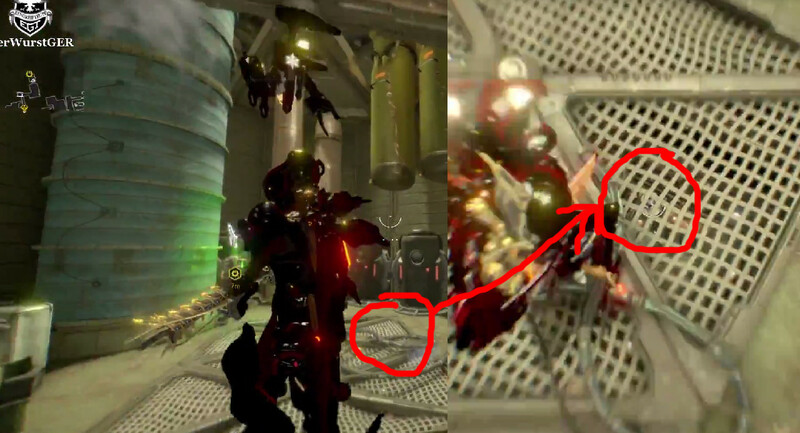 They appear to be Orokin in design, perhaps relics from long ago. I've found that I'm bad at searching for things. 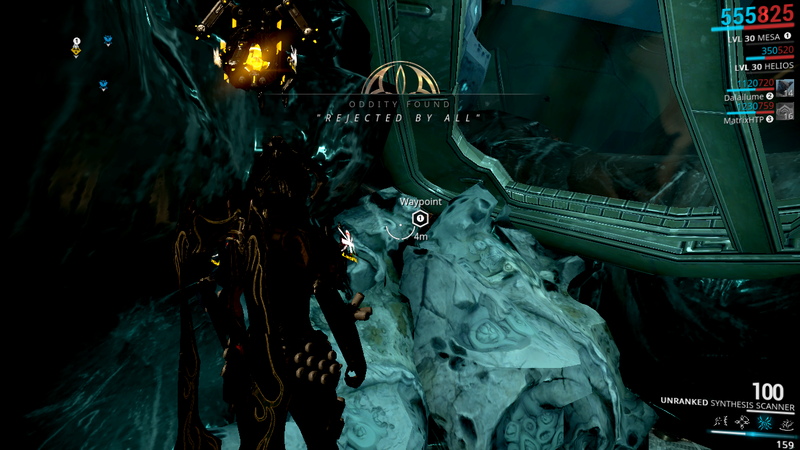 There's on on the Phobos defense tileset. Up on the cliff side. It is at the very top of one of the dead end rooms that you can wall climb wayyy up to the top of. 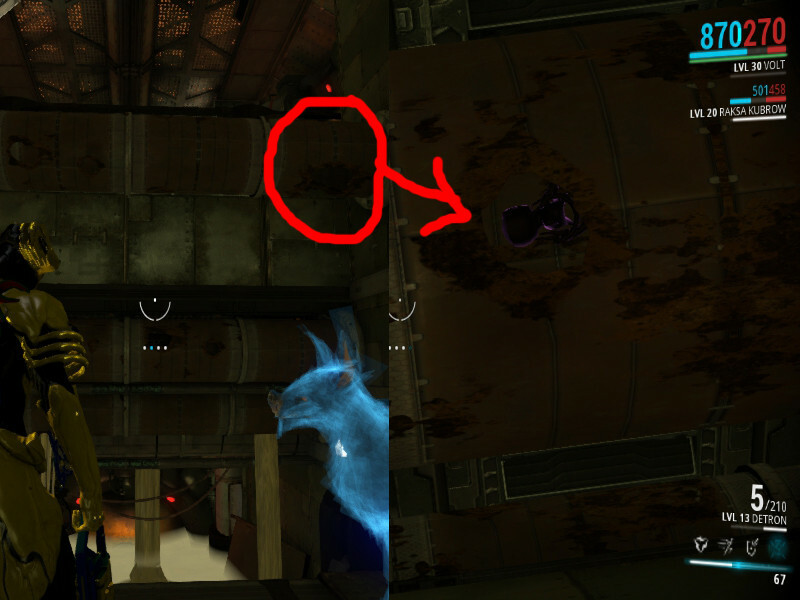 You can see what the room looks like on my map. What if we do catc... Find them all? Then what? We'll put more in...and...and BIGGER ones! But if you make them bigger, wouldn't they be easier to find? Doesn't that go against the whole point of them? Stop using logic and it'll all make sense. 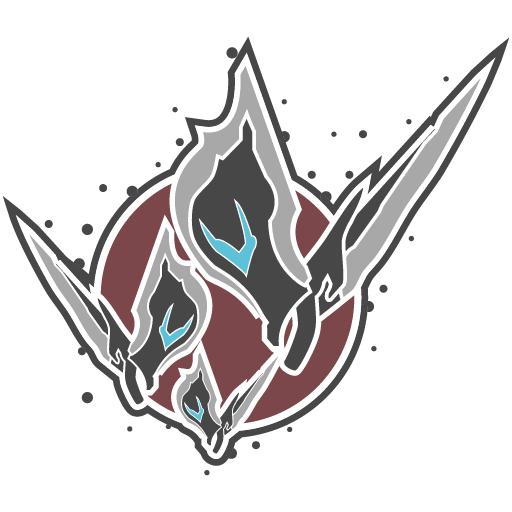 Besides, what wasn't mentioned is they'll be bigger and do 10,000,000 damage upon looking at them. Worse yet they'll act like slendermen and start creeping around .. don't.. look.. behind .. you... or like weeping angels : Don't blink. Ninja'd before I could edit in the weeping angels, damn you! 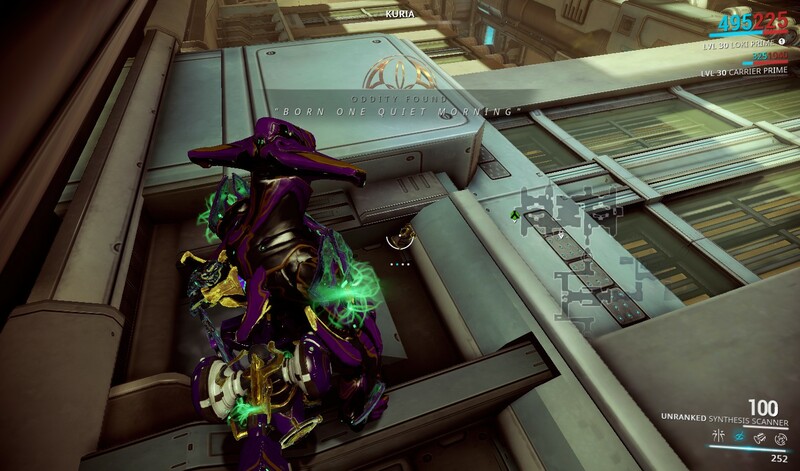 Oooo... Can we fight the infested-cat Population on them? Besides, what wasn't mentioned is they'll be bigger and do 10,000,000 damage upon looking at them, worse yet they'll act like slenderman and start creeping around .. don't.. look.. behind .. you. Weeping Angels would be better for that. New planet confirmed: Catstatueland! Could this be the homeworld of the Sentients?!? 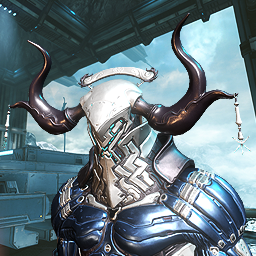 Hey is it me or does the top of the cat statue remind me a frost head piece? 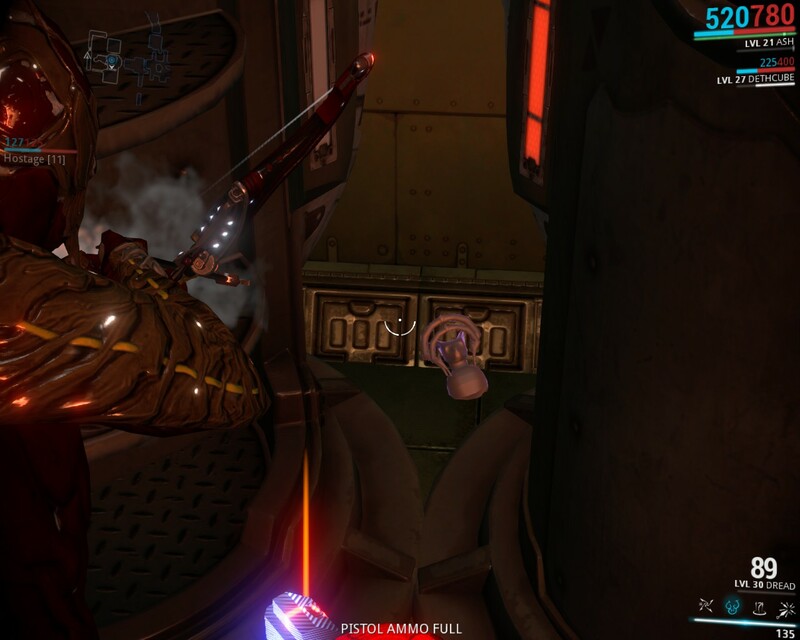 Didn't you know, Frost is a cat under all of those robes. I've... never seen these. 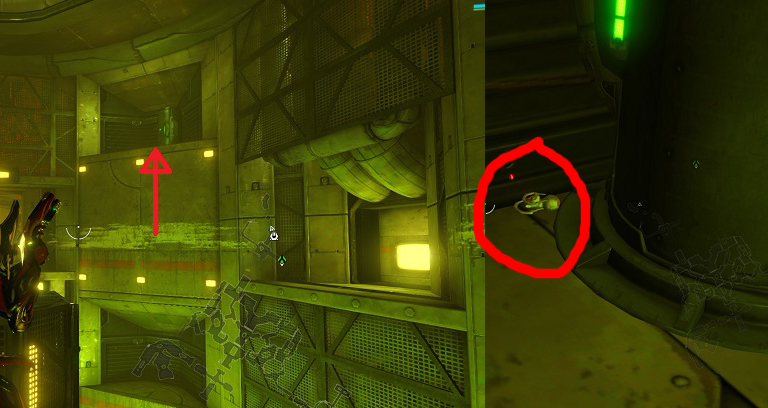 >.< Do they show up on the hand scanner? 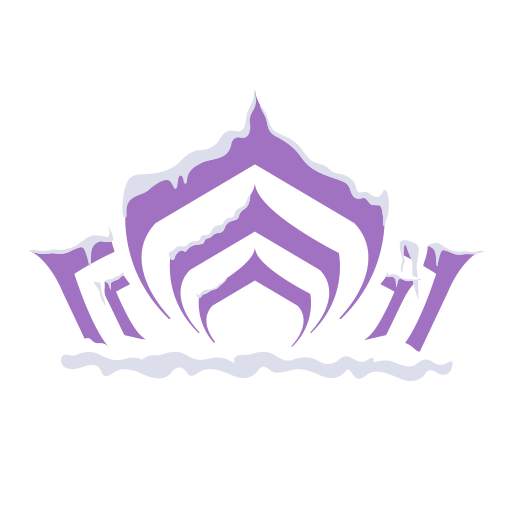 If finding them suddenly became a priority, like for Mastery Rank or something, that'd be neat. 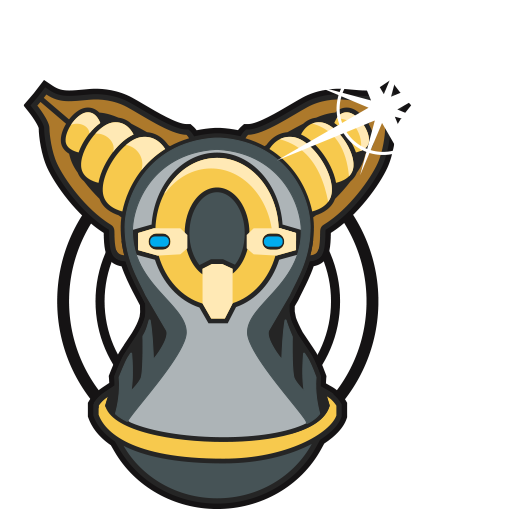 Could the Sentients BE cats? Ha ha ha someone find them all I'd love to see this happen. Maybe give us a reason for finding them, because if you think I'll go looking for them in every cranny without any sort of hint or support in what we'll get in return is not happening. Looks like a huge waste of time to me. Uhhh. 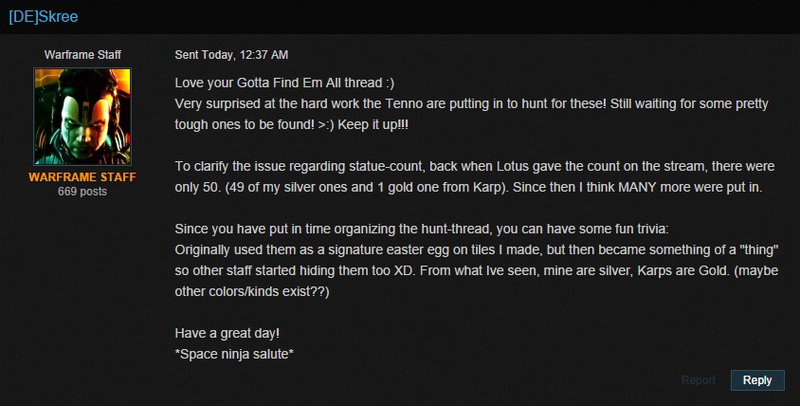 Do you get anything for finding them? Wouldn't know if you do because I am working and don't get to see the streams live anymore. But If not. Who cares?